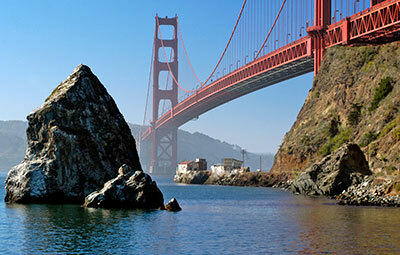 Lime Point is a rock spur, a hundred feet long and twenty feet wide, jutting into San Francisco Bay just east of the north tower of the Golden Gate Bridge. In 1833, more than a century before the bridge was built, a one-story fog signal and a two-story keepers' house were built on the spur. 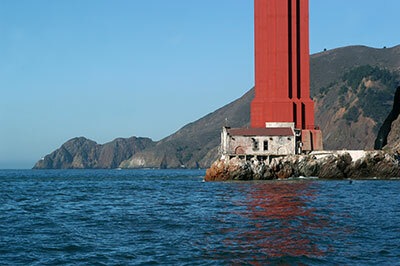 In 1900, the fog horn was supplemented with a lens lantern hung on the wall of the signal house nineteen feet above the water. At some point, a third story was added to the keepers' house and the crew was increased from two men to three. The augmented crew also assumed responsibility for the small Point Diablo light west of Lime Point just visible in the photograph as a white speck clinging to the headlands in the distance. 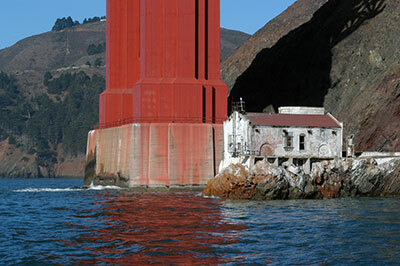 Lime Point was automated in 1961, and all of the structures except for the original fog signal building were razed. For more information and photographs, please see Lighthouse Friends.